Twilight of the Hakurei RP is an elimination-style improv Touhou roleplay game, animated using create.swf. Every season, a new group of players will begin with a group of original characters, which they will have to eliminate one by one until the season's end. Players are allowed to portray the story however they want, allowing for an even mix of comedy, drama, and high-octane action. Our icon was created by Hazama-Yuutou. The future home of the Twilight of the Hakurei Walfas RP Group! What is TotH? TotH is elimination roleplay: players begin with a series of characters, but they must eliminate them one by one as each round comes: no exceptions, no "just let them survive for the epilogue," all characters must die. The game ends when all characters are dead. Needless to say, the results are equal parts dramatic, epic, and action-packed. Coming later in 2019. Memberships and stuff to open when everything is set up which will include some new custom resources which will be used officially for the role play itself. Go down in a blaze of glory: TotH Reboot Info. Spaztique here. It's time to give you a little more info on the reboot to Twilight of the Hakurei. What is Twilight of the Hakurei? Originally conceived as a giant collaborative comic for the Walfas Station Wagon, Twilight of the Hakurei is the story of the (completely made up and totally fanon) end of the Hakurei family, and why despite the legendary status of the Hakurei bloodline, Reimu is the only remaining shrine maiden. The story takes place during Mystic Square and serves as a link between the PC-98 Era and the Modern Era of Touhou, with the battle against Makai and the Vampire Incident at the center. The way the game worked was simple: every player starts off with a group of OCs. Then, every round, they may only keep a maximum while killing off the rest. First, you are only allowed a maximum of four, then when every player had their maximum, the next round had a maximum of three, then two, then one, until finally there was nobody left. The ensuing series had over 100+ OCs across 20+ players. However, as awesome as the series was for when it ran, full of great characters, exciting battles, shocking plot twists, and hilarious gags, interest decayed. Some players didn't like the fact they had to kill off their OCs. Others didn't like how their pre-planned character deaths and plots were ruined by the collaborative nature of the series. Others simply stopped because they grew tired of Walfas and the community. Basically, the big players who kept the game running had left, leaving the original TotH orphaned, and me wondering how TotH could be ran better in the future. It's been four years, and after juggling the idea around in my head, I'm about ready to try it again with new rules. 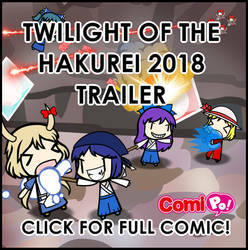 What's new in this version of Twilight of the Hakurei? There will be a limited number of player slots. The number is still being decided, but they will be reserved for those who have a capable Walfas and roleplaying track record to ensure no dropouts. If a player does drop out, their slot and OCs are up for grabs. Though, non-players are free to make supplemental comics using the cast or help players with plot stuff if asked. Players may only have a maximum of four OCs at the start, and round one has you eliminate all but three instead of four. Unlike last time, with over 100+ OCs, if there are ten players, it'll only be 40 OCs max at the start (you may also start with less), then 30 max. To ensure we don't get folks who get too attached to their OCs, they must first agree to the terms of the game before joining: no exceptions to who dies, no "bringing them back for the epilogue," no pre-planning, and so on. Since this group is outside of the WSW, galleries may be used to divide up TotH games by playthrough, as well as by supplemental or official content. We will have a group Discord chat when the time comes. Players will have access to blog and gallery controls for ease of access. They will also log the deaths themselves instead of having the GMs do it (though, GMs will supervise just in case). Submitted by DeityDiz93: There'll be a "game map" in which we can log down who is where. This way, you can plan where your characters will go, know who they'll meet on the way, and organize the story more neatly. As the premiere trailer will reveal and as the tagline above implies, this run of TotH is going to put a bigger emphasis on heroism, action, and adventure. Basically, it's going to be much lighter and idealistic than the original TotH. Players are highly encouraged to make their comics as goofy and campy as they want, and that just because each character has to die doesn't mean it still can't be AWESOME! Last time, the opening set up the Vampire Incident tying in with Mystic Square. This time, the opening only involves Mystic Square, and the travel agent behind the events is entirely up for grabs by anyone. Future games of TotH came take place during other games. There may be one that takes place before HRtP, one during EoSD, and so on. Even though the focus will be "Twilight of the Hakurei," if there are enough rounds, there might even be original elimination RP games in the future. Players must include a short synopsis of the comic they upload, which is then added to the story recap. More details to come, but for now, this is the gist of how the new TotH will be streamlined, shorter, and hopefully better than the last. Feel free to add more suggestions or general questions below. Founder and Co-Founder(s) are the Game Masters. There's a logo now? Makes me wanna join even more. Mostly. Some can be made for the RP. Or you can just make some special OCs that can fit with the RP. Just make sure to be careful with the design, backstory and character's personality.